Interested in the Salem Witch Trials? 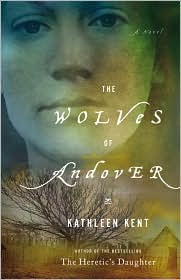 Then you should definitely read Kathleen Kent's two books, The Heretic's Daughter and The Wolves of Andover. The Wolves of Andover has now been released in paperback, and has also been retitled to The Traitor's Wife. Do not be confused - they are the same book! Click to read my review of The Heretic's Daughter and here for The Wolves of Andover. I'll put it simply: I love Kathleen Kent's writing. The haunting story of the real life Thomas and Martha Carrier during one of the most horrific moments in America's history during the Salem Witch Trials, is expertly drawn and shared in her capable hands. I highly recommend this book and if you enjoy learning about the Salem Witch Trials, you won't be disappointed. Click here to visit Kathleen Kent's website and view the book trailer. Click here to visit Kathleen Kent's blog. Click here to follow Kathleen Kent on Twitter. Click here to follow Kathleen Kent's Facebook page. I've loaded both of these to my iPod, but then had heard some conflicting opinions on them, so I've held off. I wonder why they would change the title??? I am interested in this topic and have the first one but have yet to read it! I'm curious too about why they change the title... The second one is pretty "trendy" as far as book titles go so I wonder if they thought it would do better in stores? I have these books, and have not yet read them. It's interesting to me that they changed the title of the second book, and I would love to have the inside scoop as to why. I need to make time for these books, because they sound excellent! I really loved The Heretic's Daughter and have The Wolves if Andover at home. I'm glad you mentioned the title change, because otherwise I probably would have assumed it was a new book. I've never heard of a publisher changing the title when they released the paperback, interesting. I very much liked The Heretic's Daughter (my review: http://tinylibrary.blogspot.com/2011/05/heretics-daughter-by-kathleen-kent.html) but haven't read The Wolves of Andover. In fact, I didn't even know it existed until reading this post! I loved The Heretic's Daughter, but I just couldn't get into this one. And I'm confused to as why they would change the title. I did not these were the same book! Interesting. My book club reviewed The Heretic's Daughter about a year ago. It is so amazing to think this really happened... the trials are just so crazy. I thought it was interesting they renamed this book! 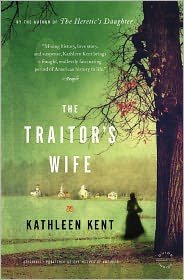 When I first saw a new title associated with Kathleen Kent's name, I was confused, but a little digging cleared it up. I really enjoyed The Heretic's Daughter, so I definitely need to read this one, too. I was confused too - I have Wolves of Andover on my shelf and was looking at The Traitor's Wife at the store and thought - these sound too similar. That is weird to me. I haven't read either of these but I am interested in the Salem Witch Trials. It does seem odd that they renamed the book. I must say, I like the second title much better. The second one catches my attention. I think you are the blogger-reason I have The Heretic's Daughter on my TBR bookcase. I'm not sure when I'll get to it, but there it is, surviving my occasional purges. I am intrigued.